People working in utilities are responsible for keeping the lights and water running in Texas communities, and with such a large population it’s a big job. 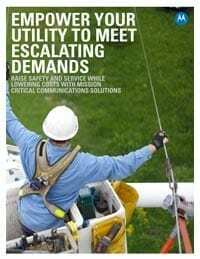 Next generation Motorola two way radio communications solutions from Aerowave are adapted to your needs so your entire utility organization is connected. Two-way radios give workers the ability to respond rapidly, share data and coordinate with dispatch. Workers in the field can ensure safety with reliable communication including push-to-talk (PTT), Lone Worker and Man Down. For the best experience, Motorola’s ASTRO 25 Communications Network is a dedicated system, so communications is always accessible, including during peak times or in an emergency. ASTRO 25 is a top choice for public service agencies because it keeps your employees and your business protected. Get the free download and learn more about how you can improve communications with Motorola two way radio communications solutions from Aerowave – your premier Motorola Two Way Radio Dealer in Dallas, Fort Worth, Waco and North Texas.